SEOPress theme is fully responsive and used bootstrap framework. It will render perfectly on all devices. SEOPress theme is optimized for search engines and compatible with all free and premium SEO plugins. SEOPress theme has special page templates for page builder and it is compatible with all page builder plugins. SEOPress has more than 200 theme options to customize global and individual page sections as you wish. Want to sell online on your website? If so, SEOPress theme is fully compatible with woo commerce plugin. Header layouts allow theme to display logo in left or center or right side and widgets in blank space. SEOPress theme has built-in options to display your social profile including a special custom social widget. SEOPress theme has advance dynamic footer widgets feature. You can disable or generate up to 4 columns. Want to set your favorite font? if so, SEOPress theme has more than 50 options for typography. All Google Fonts. Want to display images in slider? if so, SEOPres theme can display your slider perfectly and anywhere. SEOPress theme designed and developed to use on multiple types of website. Page builder can create each page unique. SEOPress theme has a Top Bar section to display social profile and quick contact info with one click enable, disable option. SEOPress theme can display sidebar in left or right side and also you can choose Full width without sidebar. Looking for a theme in local language? if so, SEOPress theme is translation ready. You can easily translate all texts. Have too much items in menu? No worry, SEOPress theme is fully compatible with all Mega Menu plugins. SEOPress theme has fancy sidebar ( secondary ) menu with one click Enable Disable options. All theme options are in customize so you will see changes happen on your website in real time as you make them. 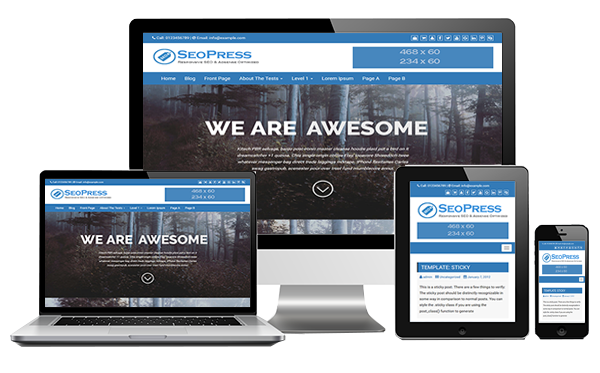 SEOPress theme will render perfectly in all types of web browser of each device including mobiles and tablets. SEOPress theme follows standard WordPress rules of theme development and it is secure, reliable theme. We update SEOPress theme regularly and take each bug seriously. We add new features base on theme users feedback. We provides high quality support as soon as possible. our theme developers will reply with best solution for each ticket.